If you would like fire wood on arrival please not there is a $15 extra charge. ONEROA VIEWS is an original 1950s Waiheke bach which has been lovingly renovated and elevated to 21st century comfort while maintaining its original heritage ambiance. Warm and sunny with magical 180 degree seaviews looking out at Oneroa Bay, The noises and Coromandal. Ideally located close to Oneroa and and across the road to a short walkway Little Oneroa beach then a 5 minute stroll to Oneroa Village Perfect for a quiet romantic escape. Situated prominently on a newly landscaped section, this cosy bach has been recently painted inside and out, a brand new modern bathroom created, new carpets and drapes installed. There is one , edroom with a queen bed, quality bed linen and a great view; a lovely open-plan living area; a well equipped kitchen and well appointed laundry. 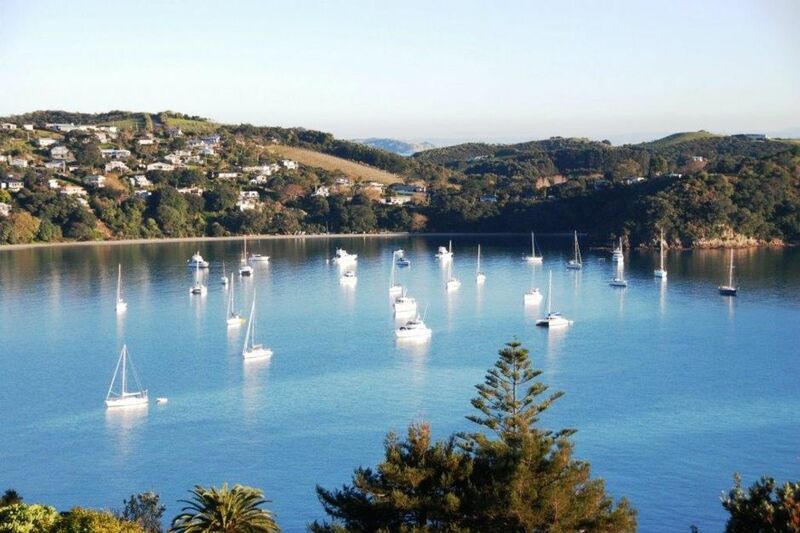 All you would ever need to make your Waiheke stay memorable and pleasurable - and easy. You will love just spending time sitting, relaxing and enjoying the peace and quiet away from your busy lifestyle. Enjoy the absolute best in panoramic views of Oneroa Bay, the Hauraki Gulf, the northern coastline and around to Coromandel from the front deck. Take a short stroll down to Little Oneroa Bay and then wander into the village for coffee and shopping. This property sleeps 4 wih an outhouse with two single beds and a toilet. Our bach is suitable for just one couple - sorry no pets. Stunning beach views and comfortable accommodation. Almost absolute perfection. The spotlessly clean batch in a prime location with stunning views was such a treat! If it wasn’t for the unbelievablabily creaky bed, the stay would have been more than perfect. A good nights sleep is quite a crucial element to a special trip away. Very keen to come back once we know the bed is replaced or fixed. The view is 5 star - amazing. Great view and location we happily walked everywhere from here and got some good excerise bed is squeaky. Greay little bach, warm, sunny. Greay little bach, warm, sunny.and private with amazing views and a real wildlife sanctuary in the garden...the perfect place to relax amd unwind after a busy start to the year..
Clean & tidy and everything you could need. Cute bach with heaps of character. Cute bach with heaps of character. Has been tastefully renovated, and the kitchen and bathroom are well appointed. The views are stunning. The location is ideal.